Welcome to Streetsville Orthotic Clinic, Mississauga! Plantar Fasciitis (also commonly referred to as heel spurs) is a painful condition that can be felt in the heel of the foot (where the plantar fascia band originates). This fascia band becomes “yanked” and inflamed if the arch is overpronating and/or excessively collapsing over time. Patients have described this pain as “walking on broken glass”. The pain is often worse in the morning or the first few steps directly after sitting/lying down for extensive periods of time. Causes: Excessive weight bearing activity, high body mass index, improper footwear, genetics, etc. Solution: Custom-made Orthotics can be constructed to support over-pronation and/or excessive arch collapse. Streetsville Orthotic Clinic uses non-weight bearing casting methods to ensure the proper shape of your foot is taken during the casting process. Flat foot (medically known as Pes Planus) is a condition where the foot has minimal/no arch. This biomechanical deformity often causes over-pronation in the foot, which leads to knee and lower back pain due to knee and hip torsion. Lower back pain is related to the foot’s poor alignment and other lower extremity biomechanical imperfections. When the feet are not aligned properly, it will create extra stress on the knees. This extra knee torsion then compliments and adds to hip and lower back torsion. Causes: Over-pronation in the foot, lack of enough shock absorption, genetics, etc. Solution: Streetsville Orthotic Clinic can correctly align your entire lower extremity by using a special shell material when manufacturing your Custom-made orthotics that will provide necessary shock absorption. Knee pain is related to the foot’s poor alignment. When the feet do not align properly, there will be internal rotational stress on the knees, which can cause knee pain as time progresses. Causes: Over-pronation in the foot, genetics, etc. Solution: Custom-made orthotics can correctly align your entire lower extremity, starting from the feet. Bunions (medically known as Hallux Valgus) is a lateral deformation of the big toe. This deformation can grow larger and more painful if irritated over time. Causes: tight fitting shoes, excessive pronation, genetics, etc. Solutions: Custom made orthotics can correct overpronation of the foot. Proper fitting footwear will prevent excessive irritation of the point tenderness against the side of the shoe. 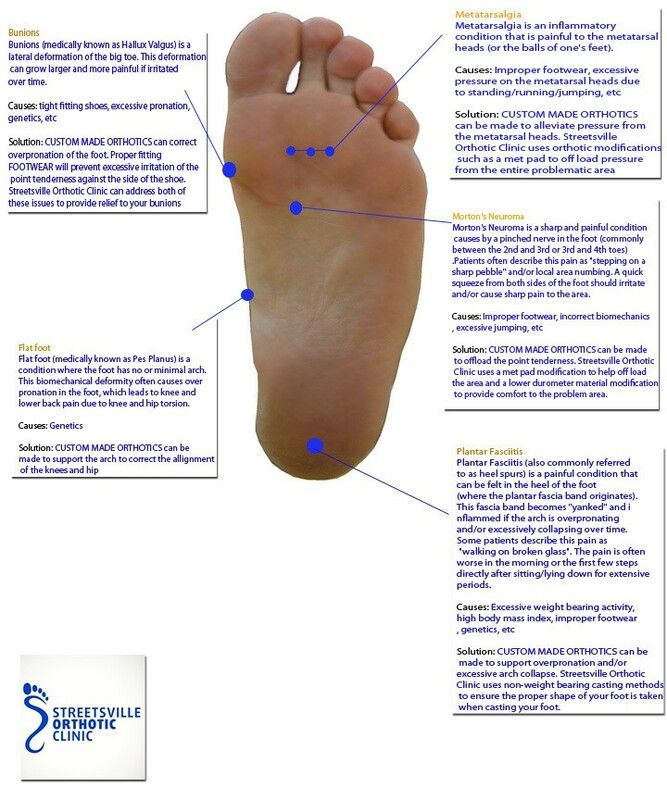 Streetsville Orthotic Clinic can address both of these issues to provide relief to your feet. Shin splints (medically referred to as Medial Tibial Stress Syndrome) are tiny stress fractures where periosteum of the muscle inserts into the tibia bone. They are typically induced through running, jogging, walking and even standing for prolonged periods of time. Cause: Muscle imbalances, muscle tightness, misaligned lower extremities, excessive pronation of the subtalar joint, lack of exercise, etc. Metatarsalgia is an inflammatory condition that is painful to the metatarsal heads (or the balls of one’s feet). Causes: Improper footwear, excessive pressure on the metatarsal heads due to standing/running/jumping, etc. Morton’s Neuroma is a sharp and painful condition caused by a pinched nerve in the foot. This is commonly found between the 2nd & 3rd or 3rd and 4th toes. Patients often describe this pain as similar to “stepping on a sharp pebble” and/or local area numbing. A quick squeeze from both sides of the foot should irritate and/or cause sharp pain to the area. Causes: Improper footwear, incorrect biomechanics, excessive jumping, etc. Solution: Custom-made orthotics can be made to offload the point tenderness. Streetsville Orthotic Clinic uses a met pad modification to help off-load the area and a lower durometer material modification to provide comfort to the problem area. Varicose veins are more common in women than in men. When the heart circulates blood throughout your body, it continues to pump down to the legs and then back to the heart. Varicose veins in the leg are no longer effective in allowing the blood flow to return to the heart and therefore result in a painful and/or unattractive condition. They are large, raised, swollen and skin coloured. Causes: Leg injuries, excessive crossing legs/standing, high altitudes, pregnancy, obesity, aging, genetics, etc. Solution: Medical Compression socks/stockings can help circulate the blood from the leg back to the heart. Spider veins are found more often in women than men. When the heart circulates blood throughout your body, it pumps down through the legs and then back to the heart. Spider veins in the leg are no longer effective in allowing blood to flow and return to the heart, resulting in a painful and/or unattractive condition. Spider veins are small, “branch-like” and either red, blue or purple in colour. Solution: Medical Compression socks/stockings can help circulate the blood from the legs back to the heart. Edema is an excessive and abnormal accumulation of fluids in the leg. 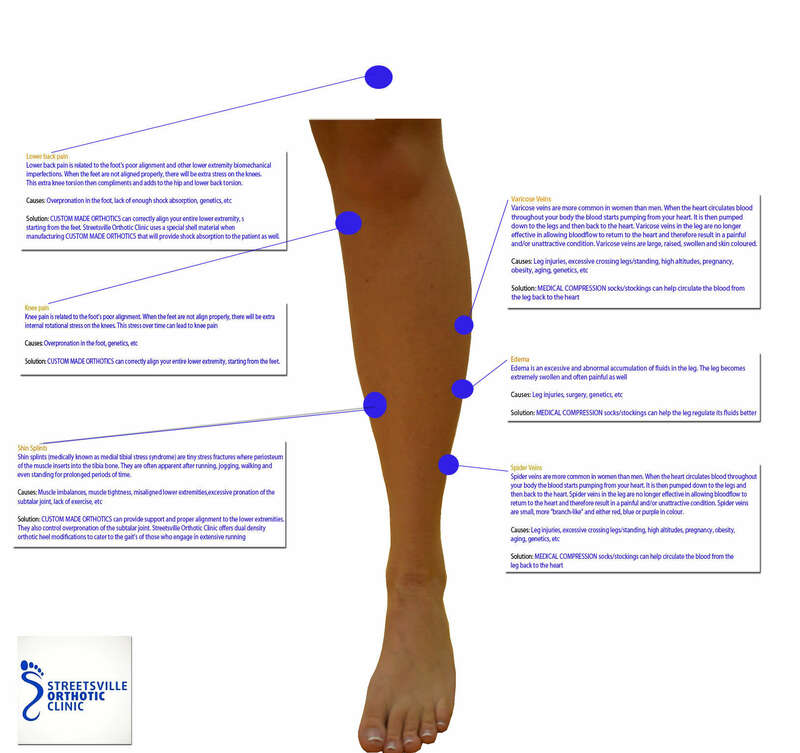 The leg becomes extremely swollen and often causes immense pain. Causes: Leg injuries, surgery, genetics, etc. Solution: Medical compression socks/stockings can help the leg regulate its fluids better.